If you own a pool in your backyard, why not build a pool deck this summer so that you and your family can have a nice time sun bathing on new deck chairs? It would be fun to spend the whole afternoon together by the pool. 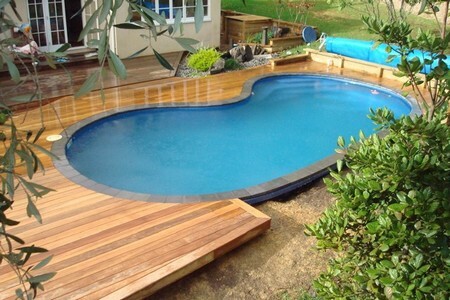 If you do not know how to build a pool deck, this is the right article for you. In this article, you will learn the steps on how to build a pool deck that is rectangular in shape out of lumber. First, you will have to have a plan of the pool deck. The plans can be obtained through the internet, or you can hire a professional to do it for you. Calculate the materials needed for the entire construction. In general, you will need concrete pier blocks, metal brackets, treated lumber, screws and bolts. You will have to go for treated lumber pieces as untreated ones will soak in moisture and it will not last long in the outdoors. Remember not to build your deck near the motor of the pool. Avoid areas with trees and electric cables. Lay out pieces of 6 x 2 lumber boards on the floor and attach them together by using metal brackets. The number of boards used depends on how long you want your deck to be. You can also use boards of other measurements depending on your personal preference. That is about it for the flooring. Move on to the posts and you will need 4 x 4 posts. Cut out the posts from the lumber and place them above concrete pier blocks. You will need to nail the posts to the blocks. The poles and pool need to be the same in height – that is why concrete pier blocks are used to elevate the deck. Check the height of the pool and the poles before nailing the poles. Then, fasten the frame that you have built earlier to the poles with deck screws. Install braces diagonally between the posts, with the braces angled towards the pool. Lay the deck boards parallel to a frame side and cut them so that they can fit into it. Affix the deck boards with deck screws to the frame. You may want to attach a pool rail and you can purchase premade rails off the rack or do it yourself with the leftover lumber boards. For the stairs, set stringers of the size of 2 x 12 to the concrete pier blocks and secure them. That is all about how to build a pool deck.